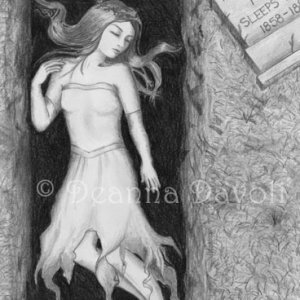 * This is the ORIGINAL ACEO DRAWING of “Freya”. 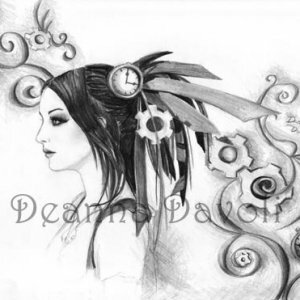 * Created using graphite pencil on paper in 2008. * Drawing is protected with 2 coats of spray fixative on it. * Framed by a Professional Framer in a gorgeous museum quality frame. * The frame is a made of solid wood & has a striking silver colored frame. * The frame is smooth along the outer portion & along the inner part has a lovely celtic-like, textured design. * The matt is a mottled gray suede & has an intricate cut out design. * Comes with hanger on back so all you have to do is decide where to hang it in your house! 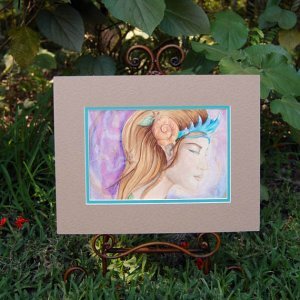 ACEO stands for “Art Cards, Editions and Originals”. – the size of a trading card.